Fig. 21-4. Data Flow During Maneuver Monitoring for CTS. The control monitor receives attitude solutions from the deterministic attitude subsystem and the rest of the data from the data adjustment subsystem. and other parameters for the scheduled maneuver. During the actual maneuver the observed pulse counts, Sun angles, spin rates, and Earth times from the data adjuster and the single-frame attitude solutions from the deterministic attitude subsystem are passed into the control monitor for comparison with the predicted values. Finally, the CTSMAN program [Tandon, 1975; Rochkind, 1973, 1974] computes the ground station commands necessary to perform an attitude reorientation maneuver, given an initial attitude and a desired final attitude. In addition, the program computes the full maneuver sequence and the history of maneuver-related parameters. A subset of the computed maneuver-related parameters is stored on a disk data set, called the predicted maneuver file, for use by the control monitor in monitoring the maneuver in real time. This section provides an overview of attitude determination systems which use star sensor data. Such systems generally use a model of the spacecraft attitude motion which is periodically updated from star sensor measurements. This model requires an initial attitude estimate usually provided by other sensor types: however, occasionally an initial three-axis estimate is calculated using star sensor data when only a single-axis estimate is available externally. The motion model used for attitude calculation may be either a simple kinematic description of a uniformly spinning spacecraft or a complicated dynamics model involving environmental and control torques. Alternatively, a system of rate or rate-integrating gyroscopes may be used to provide a mechanical substitute for a spacecraft dynamics model. The methods which use star sensor measurements to update an attitude model may be divided into two categories: batch and sequential. In a batch updating system, observations made at different times are related to an epoch time using the attitude model, and collectively identified with stars whose coordinates are supplied by a star catalog. An average or least-squares attitude-solution is then calculated and used to update the attitude at the epoch time. Additional model parameters are frequently included in this procedure. In a sequential updating system, the dynamics model is used to extrapolate the attitude to the time of each star sensor observation in succession. When the extrapolation process reaches the time of a particular observation, an attempt at star identification is made. If the identification is successful, it is used to update the attitude at the time of the measurement, and perhaps to update other parameters in the spacecraft model as well. The updated model is then extrapolated to the time of the next observation, and so on. The frequency with which the attitude reference must be updated in either system is dependent on the accuracy of the star sensor measurements, the accuracy of the motion model, and the desired accuracy of output attitudes. In addition to a telemetry processor and other auxiliary features, star sensor attitude determination software systems normally consist of five components, as shown in Fig. 21-5. The detailed makeup of these components depends on the type and accuracy of sensor measurements; the quality of the attitude estimates provided by other attitude hardware; the field-of-view size, orientation, and sensitivity of the sensor; the complexity and accuracy of the attitude model; and the desired accuracy of the attitude solutions. In star catalog acquisition, a subcatalog is acquired from a whole sky star catalog, as described in Section 5.6. The estimated accuracy of the initial attitude, the field-of-view size, the expected motion of the sensor's optical axis, and the sensor's magnitude sensitivity dictate the size and shape of the subcatalog. For example, a spherical cap subcatalog was generated for the star tracker mounted parallel to the SAS-3 spin axis. The 13.3-deg-wide cap was selected to accommodate the rotating 8- by 8-deg field of view and approximately 2 deg of potential spin axis error. It contained 30 to 50 stars brighter than the 7.5 instrumental magnitude limit. A I2-deg wide band subcatalog generated for the SAS-3 tracker perpendicular to the spin axis contained approximately 2000 stars brighter than an instrumental magnitude of 7.5. Fig. 21-5. Major Components or a Star Sensor Attitude Determination System. A telemetry processor and possibly other auxiliary components as described in Section 21.1 are also required. 7.6) consists of a series of voltages which must be examined to determine when a transit occurred, i.e., when a star crossed one of the slits. By examining the differences in time between all transits of slits 1 and 3 (see Fig. 7-24), many differences are found corresponding to 9/u, where 9 is the angular separation of slits 1 and 3 and u is the spin rate. If the number of transit pairs separated by approximately 9/u is plotted as a function of spin period, as shown in the spin rate histogram of Fig. 21-6, an initial estimate of the spin rate is obtained. This spin rate is then used to group the transits into triplets corresponding to the three slit crossings by the same star. As another example, SAS-3 star tracker data is examined to remove all points except those corresponding to valid star sightings by examining various telemetry flags. 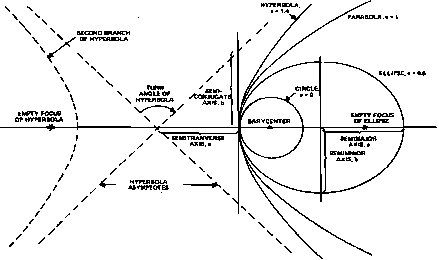 The star sightings are then calibrated and converted into unit vectors in the spacecraft frame, as described in Section 7.6.